Type 2 Diabetes (and its root cause: insulin resistance) is truly an epidemic in our society. Thus it’s only a matter of time before every practitioner has at least a handful of clients with blood sugar control issues. The good news is that Type 2 diabetes is absolutely reversible! Long-term healing requires a client to change their diet and lifestyle substantially. And, as you know, some of them just aren’t ready emotionally for that change. It takes time. But in the interim, these clients absolutely need help alleviating the toxic effects of elevated sugar on their organs and glands. As a scientist at heart, I am inherently skeptical of claims of seemingly “magical” effects of herbal remedies. Some are absolutely true, but many are overblown (just as we see with pharmaceutical remedies, marketing claims can be predatory and irresponsible). I want to introduce you, however, to an herbal solution that holds up very well to scrutiny: berberine. Like another herbal powerhouse curcumin, berberine is a plant phytonutrient, specfically an alkaloid. It’s been used for eons as a natural antibiotic. I’ve used it successfully in my practice to help people who choose natural treatment (as opposed to prescription antibiotics) for all sorts of unwelcome microbial infections…bacteria, viruses, yeast, parasites. 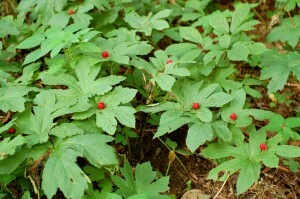 Berberine is extracted from a number of medicinal herbs, most commonly oregon grape root, barberry, and goldenseal (what you see in the picture above). But that’s only the beginning of berberine’s power. A couple of ground-breaking 2008 clinical studies found that berberine regulates blood sugar in Type 2 diabetes just as well as the blockbuster drug Metformin (and with no measured side effects). No, I am not exaggerating. In peer-reviewed studies in the medical journals Metabolism and the Journal of Clinical Endocrinology, berberine was found to lower both fasting and post-prandial (after a meal) blood sugar and insulin EQUALLY as well as Metformin (the generic form of the popular drug brand glucophage used in diabetic patient treatment). And beyond blood sugar, berberine also reduced those participants’ triglycerides by 35% and their LDL cholesterol by 21% and their blood pressure by 7/5 mm Hg (three things Metformin can’t and doesn’t claim to do)! These further effects are critical benefits for our clients with not just advanced insulin resistance but full-blown metabolic syndrome. Berberine works because it activates a primal metabolism-regulating enzyme in the body called AMPK. When we are producing less ATP (energy) in our cells, the body secretes AMPK to ensure our survival in times of crisis. This is the same enzyme that gets triggered with severe calorie restriction (which has been shown to prolong life in animals, but is practically sustainable by very few). AMPK stimulates our cells to take in more blood sugar, thus improving insulin sensitivity. But it also slows our liver’s own production of extra blood sugar (a key issue for most Type 2 diabetics). By supporting our liver, berberine also slows the release of free fatty acids into the blood (which is what creates triglycerides) and boosts natural fat-burning in the mitochondria (the little energy factories in all our cells that turn fuel into energy). For the typical adult, berberine is effective for blood-sugar management taken 400-500mg at once, twice or thrice a day, ideally about 30 minutes prior to each meal. To ensure your client gets an effective dose each time, I suggest choosing a product with a standardized berberine extract (as opposed to a whole-herb product like goldenseal). I recommend Thorne’s Berberine-500 product or (if your client is struggling with GI issues as well, like gas and bloating) try the multi-herbal formula Metagenics CandiBactin-BR. On a side note, if your client is indeed taking Metformin, make sure they take a daily Vitamin B12 supplement with a meal (e.g. 1000mcg methylcobalamin to ensure cellular absorption, not cyanocobalamin). An easy-to-find, high-quality brand is Jarrow Methyl-B12, available on-line from many outlets or at Whole Foods Market. A significant, documented side effect of Metformin is Vitamin B12 depletion, making neuropathy an even larger risk than it already is for diabetics. If your client is an insulin-dependent diabetic (i.e. taking insulin shots), be sure to encourage them to monitor their blood sugar regularly as they start to use berberine or any new therapy (and have them consult their doctor if they’re uncomfortable doing so). Encourage them to start with just one dose/day and increase slowly to ensure they can stay in control. They may need to cut back on their insulin dramatically to avoid dangerous lows. Almost all of my clients eventually end up able to stop both Metformin and supplemental insulin. You should strive for the same goal! Ultimately all Type 2 diabetics should work on sustainable lifestyle and diet change to be able to stop supplemental insulin in particular. While life-saving as a short-term, triage therapy, long-term insulin use makes Type 2 diabetics even less healthy. Surplus insulin promotes more inflammation in the body, imbalances hormones, and increases body fat storage, especially in the abdominal area (again, a source of inflammation and estrogen!). Perhaps like you, I still find it amazing that this type of solution (and its clinical study results) doesn’t typically make media headlines. And this one is from 2008 – several years ago. Of course, I understand you cannot patent an herb. And so no single corporation stands to corner the market on berberine. But this is BIG news for the millions of people struggling with diabetes! Actually, it’s not the only natural remedy I’ve seen successfully stabilize and then help to reverse Type II diabetes, but it is definitely the most potent one. Help your clients and patients to believe that they are neither “doomed” or “destined” to live their entire lives with Type 2 diabetes. With your help and their commitment to change, they can find true healing! Type 2 Diabetes is absolutely reversible! I offer a course to teach healthcare practitioners exactly how to do that clinically. Please note that this Clinical Tip post is closed to further Q&A. We hope you review and take advantage of additional learning from the the Q&A posts that are already available. I have been taking 900 mg berberine supplements twice a day 10 mins after meals and yet my fasting sugar is still around 220. Do you think it will help lower sugar further if I switch it to 30 mins before meals ? I am not taking any diabetes medications. I am using ” We like Vitamins” from Amazon USA. Thank you for your help and suggestions in advance ! Indeed, the effectiveness of berberine will likely be dramatically better if you take it 30 min. before a meal as opposed to during or after the meal. Just keep in mind that changing to a low-glycemic diet is also a requirement. The supplements alone are not sufficient to reverse the insulin resistance dynamic. You may also need other supportive nutrients; we often recommend Designs for Health’s “Metabolic Synergy” as a multinutrient formula focused on this particular goal. Of course, we cannot advise on your unique situation in this format, so be sure to consult your healthcare practitioner for any pertinent individual caveats. We wish you the best of wellness! Fasting glucose 145-155, now on Metformin 500 twice per day. Can I also go on Berberine, like once before dinner? Is it OK and safe to take both metformin and Berberine? I will share that generally, I have had many clients successfully use both in tandem until they were able to stop the metformin (as their insulin sensitivity improved; typically using the berberine 2-3x/day). However, of course, I cannot give you individual guidance via this type of venue; it’s important for you to work with your healthcare provider to take into account any unique concerns your might have. It’s also important to realize that berberine is quite potent and effective for this purpose, and your blood sugar levels might drop more quickly than you anticipate if using the combination (especially if you are also modifying your diet and/or using targeted supplementation to improve insulin function simultaneously). I just recommend one be cautious and monitor blood sugar frequently to be aware of how a unique body is responding. Hello! I have read your information with keen interest. I was wondering if you have seen studies of Berberine in the realm of Type II diabetes suggesting it to be more statistically effective as a stand-alone supplement or has it shown to co-support more effectively with others such as Gymnema Sylvestre, Alpha Lipoic Acid? Some supplements are delivered and absorbed more effectively when taken with support vitamins, minerals or herbs. Locating studies with this information has been a challenge. Thank you for sharing your knowledge. You are very welcome. Indeed, I am not aware of published clinical trials for the combinations you mention. I am very aware of the efficacy of them, however, both in my own practice and in that of many others. The combination of ALA and berberine in particular (combined with optimal magnesium repletion) is powerfully effective for many *assuming* one makes and maintains the necessary dietary changes. I was prescribed metformin recently. I am not diabetic but I am showing insulin resistance. A month ago I changed my diet ( with the help of an phentermine to control my appetite), eliminating all breads, crackers, sweets etc. I ate fruits, vegetables, nuts and I use plant based protein powders with no added sugar, almond milk etc. Did high intensity workout 5-6 days per week. I lost 17 lbs last month. When I went to follow up, that’s when I was prescribed metformin. Some of my family members were a little concerned so I haven’t taken it yet. My aunt had suggested I take chromium instead or berberine. I’ve taken berberine before but at the time still had difficulty adjusting my diet. So now my concern is about the metformin dropping my blood sugar very low , since I don’t have high blood sugar to begin with (and I made adjustments to my diet), I just have elevated insulin levels. my A1c is 5.2. Thanks in advance for your feedback. Good for you – congratulations! Your post is a GREAT – and hopefully inspirational – example to others as to just how much different diet makes. We see this in our patients and clients All. The. Time. You are being empowered and taking action to naturally reverse your insulin resistance. Hyperglycemia typically shows up after insulin resistance has been going on for a while (years) behind the scenes, but you are working to get in front of that and actually prevent it! I have personally worked with many clients over the years who have been able to do so by combining short-term berberine use (~2-3 mos) along with simultaneous and then ongoing (1) dietary change as you describe, plus (2) supplementation with the key nutrients to improve insulin sensitivity (as you said, chromium but perhaps an even more powerful multi=nutrient formula like Designs for Health’s “Metabolic Synergy”). Is berberine ok to take if you are suffering from hypoglycemia ? thanks in advance for your feedback . I would not. Berberine is indicated for insulin resistance that has progressed to hyperglycemia. I would not use berberine when there is consistent hypoglycemia- which is often the case with moderate stages of insulin resistance where fasting insulin has increased dramatically due to the pancreatic response to our diet. It is better to counter this stage of IR with dietary change (eliminate refined carbohydrates and perhaps reduce them overall) and nutrient support (e.g. chromium, biotin, magnesium). Keep in mind also that some hypoglycemia is a result of disordered cortisol, so insulin resistance is not always the cause (and of courser berberine would not address the root cause in this case). I’m finding your information very helpful. This is the first time I’ve seen it noted taht berberine should not be used long term, was not aware of that. I have a question about the diet you recommend to reverse insulin resistance – I am trying to eat much less carbs, particularly processed ones, and mainly vegetables, healthy fats, and proteins – however I have foudn that the total elimination of carbs wreaks havoc with my digestive system and causes me to have a diarrhea – so now most days I also have some basmati rice, which helps keep my bowel movements regular. I woul dbe glad to hear of any suggestions for eliminating all carbs without having GI issues. I am not sure what you mean when you say “carbs”. People can have quite variable tolerance of overall carbohydrates in their diet, so there is no “one size fits all” recommendation for al. You can indeed readily get the carbohydrates you need from vegetables, fruits, nuts/seeds, and perhaps legumes. We generally find that refined grains – that is things made out of flour – need to be eliminated in the process of reversing type 2 diabetes. Some people can tolerate daily doses of whole grains while others fully eliminate them. If you were constipated in your journey – the most typical challenge *if* folks have GI issues with this path, you likely were not getting enough fiber overall – and perhaps not the best mix of soluble and insoluble fiber. However, the fact that you have diarrhea tells me that there is a food sensitivity or maldigestion/intolerance at play; diarrhea would *not* be a common reaction at all to this type of dietary change. I really recommend working with a practitioner who can help you to sort out and support your unique body’s needs. I’m type 2 diabetic and I’ve been using Berberine for a couple of months with great success. Just had my annual exam; A1C is 5.8, cholesterol is perfect (it’s NERVER been good before) and blood pressure was the best it’s ever been. However, I’ve had diarrhea from 21 days now and so far there is no explanation. Not symptoms other than extreme diarrhea. I know Berberine is supposed to be helpful for diarrhea but I’m wondering if it could be the cause of it as well? I take 500mg 3 times a day. Good for you! Indeed, as is true with many herbal remedies, there are many pathways of action and impact in the body. Berberine also works as an antimicrobial agent. In some people this is stabilizing and (as you said) may address imbalances in microbial populations in the gut which contribute to constipation or diarrhea. In others, however, ongoing use of berberine can *create* a microbial instability. Keep in mind that long-term use of berberine is not recommended. The goal is to use berberine for a few or several months in order to reverse the insulin resistance *while* you are changing your diet – toward the goal of getting you to a place where you no longer need it. Right away, I would add in a daily full-spectrum probiotic (e.g. Klaire Lab’s “Therbiotic Complete”). If that does not alleviate the diarrhea after a full week, then I would also do a trial of stopping the berberine for 4-5 days to see if it’s at the root of your bowel changes. Anyway…I no longer take Clonidine, and I have brought my blood sugar levels into a more normal & healthy range of 6.2 with diet and supplements, along with Metformin. I am currently taking Metformin 500 2x daily PLUS Cinnamon, Alpha Lipoic Acid, Chromium, B12, Magnesium and Gymnema Sylvestri – all of which are supposedly helpful for insulin resistance. I do not take any other medications although my doc has been after me to take a statin. I refuse. I have recently been researching Berberine and am eager to try it, hoping for positive results for both diabetes – and from what I understand – cholesterol. I would love to stop taking Metformin if possible. My question is, with all the other supplements I am already taking, do you advise making any adjustments (as in, eliminating some of the other things I take) or simply adding the Berberine and monitoring my blood sugar? I’d rather take fewer pills than adding more to the mix. There’s so much information out there and it’s hard to know exactly what to do! I’ve researched a lot and am taking all the things that my research has indicated would be best. Thanks so much for providing guidance for people like me. Alas, we are not able to give individual guidance via this forum. I would say in general that I think it’s better to find a combination of items that actually fully works for you in reversing your insulin resistance *first* – before you start eliminating things. Please be sure to read all the other comments posts here for other precautions I have offered that will likely apply to and resonate with you as well. Your progress is awesome (congratulations! ), but I know you really want to be even non-pre-diabetic and drive that HbA1c back down into the low 5s. Given how well-researched you are, I assume you are aware of just how critical the food side of the reversal process is; the supplements alone will never work. I recommend 100% elimination of fruits juices, all foods made with flour (gluten-free or not), and added sweeteners (perhaps except small amounts of stevia – but it’s a good idea even to wean off of that over time). The pancreas needs to given an aggressive and lengthy break from having to manage carbohydrate surges in order to fully heal. Best of wellness to you! Absolutely agree with the nutrition aspect! That is the MAIN thing we all need to do for ourselves – diabetes or not. I have eliminated flour, sugar, etc. and only consume stevia in some of the Greek yogurts I eat, and a little in my morning coffee. I routinely eat nuts, cheeses, veggies, chicken/turkey, seafood, some lean beef, and dark chocolate (88% cacao, organic.) I drink nothing but water (lots of water), coffee, tea and red wine. NO JUICES! No sodas, no fast food, no junk food – obviously. My meals are small and frequent. Good for you! Berberine is going to shift your gut microbial balance as a side effect; changes in bowel movements are common. Typically boosting your magnesium intake helps greatly. It’s a very common nutrient *insufficiency* – and many more people are truly deficient. Magnesium citrate is an excellent form for this purpose, and you can experiment with the dosage you need. Take it at night w/dinner to help with having a more consistent and complete morning bowel movement. You might start with 100-200mg per dose and build from there if you need more. Best of wellness to you! Indeed, Sandy, I am not able to give detailed, individual guidance via this forum. I am not aware of any contraindications in what you list, but each unique body is different. As I’ve shared in other replies to this post (please read them all), the most important thing is to closely monitor your blood sugar to ensure it’s not dropping too low given the coincident use of metformin. If you are trying to protect your kidneys, I also recommend Benfotiamine (a fat-soluble form of Vitamin B1) as well as additional antioxidants. If you can ignore the name, something like Life Extension’s “Alcohol Antioxidants” can be a great kidney support, especially when the concern is regarding oxidative damage to the kidneys due to blood sugar elevations from T2D. A functional medicine practitioner working with you one-on-one could definitely help you to sort out the type/combo you have and how to address is aggressively. Again, please read the other posts here, as I think you will find them helpful. Wishing you the best of wellness! Hi. My teen daughter has shown almost all the symptoms for PCOS for 9 months and although drawing a clinical conclusion rather than lab work and scans which were inconclusive, the GP has prescribed Diane 35. The more I read, the more I resonate with the conclusions that PCOS can be misdiagnosed as the cause rather than a symptom itself of Insulin Resistance. I’m going to try and find a functional medic who can help us, but in the meantime, there’s one piece of information I can’t seem to find and wonder if you’d share your experience? If Berberine isn’t recommended as a long term solution due to gut flora, how long is it likely that someone should take 1000-1500mg/day in 2-3 doses (patient specific) for? And at that point is the body likely to be fully functioning again on its own, or is it more likely that Berberine needs to be used again…if so, after what likely period of time? Many thanks in advance. Good for you! I have found in my own practice that literally 100% of PCOS cases are secondary to insulin resistance – in some cases paired with overexposure to xenoestrogens in things like personal hygiene products and pesticides. Bottom line: your daughter has to change her diet if she wants a hope of not having the PCOS be an ongoing battle. The insulin resistance has to be countered – initially aggressively – and then sustainably. Fasting insulin should optimally be way down in the reference range (~5-6 mIU/L). When I work with clients one on one, I generally share that the journey for reversal typically takes about 5-6 months with strong compliance, and I won’t typically recommend berberine for longer than 12-18 months. Specifically for PCOS, I also recommend you investigate using inositol. The other posts here on this thread will be helpful for you, so please review them. It’s also key that her magnesium be optimal – ideally in the upper third of the reference range *specifically* for RBC magnesium (not serum). I wish you both the best of wellness!